Fit for Success: Expand Your Horizons!!!!! Today I tried a kickboxing class for the first time and it was SO much fun!!! Usually I feel so awkward going into a class for the first time, alone, when I have no CLUE on what to do! Of course it's intimidating, but I found that there were several first-timers (like half the class), and it is not about knowing what you're doing- it's about getting in a GREAT workout! Boy oh boy did I have fun. First of all, it was hilarious to see myself in boxing gloves. Second of all, it was even more hilarious to watch myself kick and punch a bag bigger than I am (and it was a blast). Third of all, the instructor was cute. Makes you work harder! But seriously, I got in such a great workout. I am SUCH a believer in workout classes because it is a great way to switch up the routine and avoid boredom. I honestly didn't even feel like I was working out tonight because my mind was so focused on learning everything! Little did I know that I was dripping sweat! Moral of the story: switch up your same-ole gym routine and try something new! It is impossible to be a professional at everything you try, so step into that Kickboxing class or hit the pavement for your first run. I am so glad I took that hesitant step into the kickboxing class. It wasn't so bad and I found something I really enjoy! 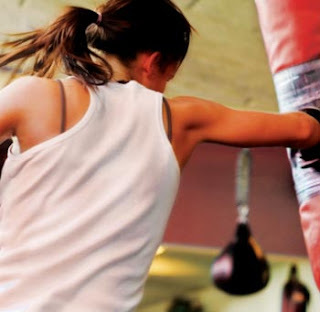 Even if you don't have a gym membership, there are many gyms that offer classes for only $10! So check out your local gyms and have fun!!!!!! Keep Your Diet on Track: "My Fitness Pal"
A Typical Day of Morgan's Eating! Easy & Healthy Dinner Idea!